We’ve got word of more new Transformers in Australia. This time out it’s the wave 2 Siege Micromasters. This assortment adds two new two-packs – the Spy Patrol of Ravage and Laserbeak, and the Rescue Patrol featuring Stakeout and Red Heat. The pair were spotted in a Toyworld in Victoria. Could a US sighting be far behind? Keep it TFW2005 to find out! A large celebration of the Bumblebee movie and focus on the toys for the movie. A celebration of Bumblebee as a character including the dozens of Bumblebee toys released over the last 35 years – including the recognition of Armada Hot Shot as Bumblebee’s “missing link”. 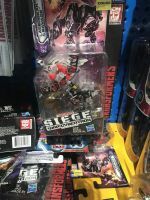 A showcase of the other new toys from Tokyo Toy Show, including Siege Jetfire and Brunt, Studio Series Dark of the Moon Megatron, and MP-45 Bumble version 2. A showcase of licensed Transformers merchandise including Kaiyado’s Amazing Yamaguchi Revoltech Optimus Prime and ThreeA’s Blitzwing. Some preview panels of the upcoming Mazinger Z vs Transformers manga. And perhaps most impressive of all, an interview that includes many images of early Transformers and Diaclone prototypes. There’s some familiar ones like Optimus Prime and Metroplex and some stuff we’ve never seen before like a triple changer Cessna aircraft that turns into a construction vehicle as well as a robot. Two exclusive covers have been released for the upcoming Japanese manga, Mazinger Z vs Transformers over on villagebooks.net. The first of these covers is a team-up shot by Ken Ninba, showing the titular Mazinger Z behind a lineup of classic Transformers characters such as Optimus Prime, Devastator, Prowl, Grimlock, Rumble, Skywarp and Thundercracker. The second cover plays up the “vs” aspect of the crossover and features art by Yuuki Oshima. This cover shows Mazinger Z squaring off against Optimus Prime, readying his signature Rocket Punch against the Autobot leader. Mazinger’s allies Aphrodita A and Boss Borot race to support Mazinger, while Bumblebee dives out of the path of the Mazinger. Megatron, the Decepticons, and Mazinger’s arch enemy Baron Ashura are visible in the background. We like this cover as it accurately shows how huge the Mazinger is compared to the Autobots. This crossover is due to arrive in March, and should be a battle for the ages. Hopefully this might open the way for more Transformers crossovers with other classic series – or dare we say, Transformers joining Super Robot Wars? 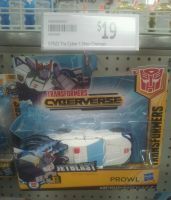 Via TFW2005 member Shattered Trousers, we have word that Transformers Cyberverse One Step Wave 3 has been released in Australia. 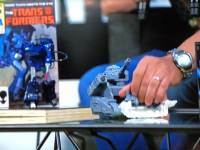 The assortment consists of four all-new toys – Optimus Prime, Megatron, Bumblebee (all three in new molds compared to their earlier releases) as well as Prowl. The quartet were spotted in a Target store in Victoria. Happy hunting, one and all! We have received an update from our sponsors Robot Kingdom. Check out some highlights below and read on for the full update. #1 Many Hot Items new listings from New York Toy Fair! Transformers Collaborative: Ghostbusters Mash-Up – Ghostbusters Echo-1 Ectotron. Transformers Collaborative: Ghostbusters Mash-Up – Ghostbusters Echo-1 Ectotron. Preorder. Start Shipping on 1st June 2019. Transformers 2019 Siege of Cybertron TITAN OMEGA SUPREME. Transformers 2019 Siege of Cybertron TITAN OMEGA SUPREME. Preorder. Start shipping on 1st August 2019. Generations 2019 Siege of Cybertron COMMANDER JETFIRE. Generations 2019 Siege of Cybertron COMMANDER JETFIRE. Preorder. Start Shipping on 1st July 2019. Generations 2019 Siege of Cybertron Leader Wave 2 OPTIMUS PRIME (GALAXY UPGRADE). Generations 2019 Siege of cybertron Leader Wave 2 OPTIMUS PRIME (GALAXY UPGRADE). Preorder. Start Shipping on 1st July 2019. Generations 2019 Siege of cybertron Deluxe Wave 3 set of 4 (HOUND, RED ALERT, Unknown Character 1, Unknown Character 2). Preorder. Start Shipping on 1st July 2019. Generations 2019 Siege of cybertron Voyager Wave 3 set of 2 (STARSCREAM, SPRINGER). Preorder. Start Shipping on 1st July 2019. Hasbro Transformers Studio Series LEADER TF3 Optimus Prime. Hasbro Transformers Studio Series VOYAGER Wave 7 set of 2. DNA DESIGN DK-10 Studio Series Ironhide Upgrade Kits. Takara Transformers Masterpiece MP-45 Bumblebee Ver.2.0. Takaratomy Mall Exclusive Masterpiece MP-18+ Bluestreak. Hasbro/Takara Transformer Movie Masterpiece Series MPM-8 Megatron. Toy World TW-C07H Dark Constructor. Limited to 200pcs Worldwide. It’s time for a wizard bowel bodcast with Aaron and TJ, hosted by Vangelus (a wizard). We’ve got more toy reveals ahead of the US Toy Fair, with Amazon this time stealing some of Hasbro'[s thunder by revealed the Transformers Siege Battlemasters Wave 3. This assortment adds Smashdown and Caliburst into the mix of bots who turn into weapons to arm other bots. Caliburst is somewhat disappointingly a purple and black redeco of Blowpipe from Wave 1, which means neither his deco nor his design much resemble his Generation 1 namesake and leaves Slugslinger without an accurate partner (balancing this though, the Hasbro Slugslinger’s guns already looked very close to Caliburst’s original gun mode and Takara’s Slugslinger already had the Targetmaster). Caliburst comes with a purple laserbeam effect that looks very cool and might be worth the price of admission alone. Smashdown is an all-new character designed to look like a minotaur. That’s pretty cool as we don’t see many mythical creature Transformers – and then he adds to the fun by turning into a warhammer. His effect part is a big yellow “wallop” effect to give the impression of the hammer coming down hard – and judging by the image with Springer, this can also double as a powerful cannonblast effect when turned backwards. Yes, we’re liking this one. Share your thoughts on these new reveals in the discussion linked below. True story – Vangelus woke up from a slumber literally minutes before recording this podcast. Seth was well-prepared to talk fresh MPMs and human engagement. Good news, everyone! TFNation have opened tickets for their 2019 convention. You, yes you, can book your tickets to the largest Transformers convention in Europe and the UK! Tickets are priced at £65 for adults for the whole weekend – young people 17 and under go free, yes, free! Can’t make it to the whole weekend to meet your fellow fans? No problem! TFNation are also offering day tickets for those who can only attend on the Saturday or the Sunday – but really, the best experience is to be had by attending both days. What are you waiting for? Head on over to the TFNation homepage and buy your tickets to TFNation 2019 today! TFNation 2018 will be taking place over the weekend of 16 – 18 August 2019 at the Hilton Birmingham Metropole in Birmingham in England. Guests include voice actions Gregg Berger (Generation 1 Grimlock, Jetfire, Long Haul and more), Peter Spellos (Robots in Disguise Sky-Byte) and further guests yet to be revealed. Panels will include a special look at rare, unreleased and never-before-seen Transformers merchandise. Check out the TFNation homepage for more information and to pre-register. Amazon Canada has added a pair of new listings, one of which we’ve known about for a while, and one that is new to us. First up is for a War for Cybertron Titan Class figure. Priced at $250CDN, this is the listing for the Titan Class Omega Supreme figure teased at New York Comic Con. 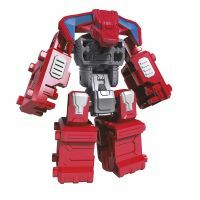 He’s set to be the big ticket item of the War for Cybertron line and will also include a bonus Micromaster, Countdown. Second is the mystery listing. This is for a War for Cybertron Commander Class figure, which is priced at $120CDN. 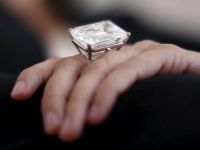 We’re not sure that this one is for, although given the price it is likely to be something quite substantial, perhaps in line with the Supreme class figures of the past. New York Toy Fair is not too far away. Perhaps we’ll learn more at that time.